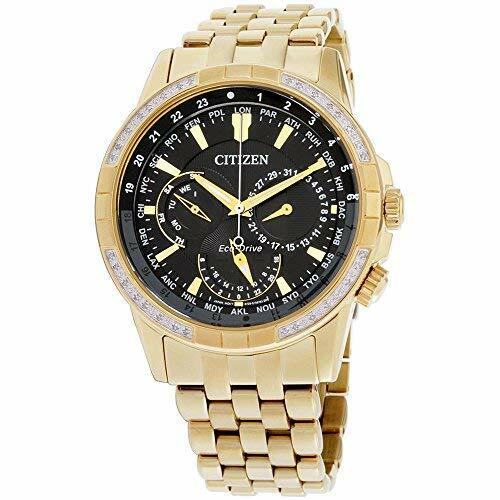 From Citizen, this Calendrier gold tone watch is perfect for that world traveler always on the go. Never be late to your next appointment with 12/24 hour time and the accompanying day/date. Featuring a black dial and diamond accents, the watch case is 44mm in size and is made complete by a stainless steel band. The band has a deployment clasp with push buttons for ultimate comfort and safety. Powered by any light, this timepiece will never need a battery. Quartz movement. Black Dial and diamond accented bezel. 12/24 Hour Time, day and date. Water Resistant up to 100m. Gold-toned stainless steel 44mm case. Gold-toned stainless steel bracelet watch. Solar powered. Citizen Style #: BU2082-56E.